youth, as yoga nourishes the mind, body, and spirit, and paves the way for a life-long tradition of health and fitness. 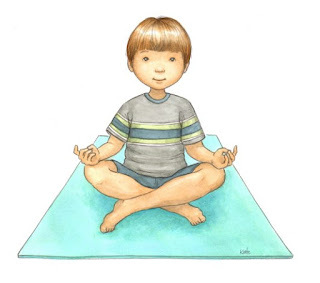 Children of all ages and sizes and varying degrees of athletic abilities can practice yoga, a non-competitive form of exercise. the brain. They are able to learn new things faster and more effectively, which equates with better school performance. An example of a yoga pose that helps master the mindset of focus is Tree pose, pictured below. This posture helps with concentration and balance. (Illustration adapted from The ABCs of Yoga for Kids written by Teresa Anne Power and illustrated by Kathleen Rietz. this translates into healthier minds and bodies, not to mention a better performance at school. which is on April 8, 2016. For more information go to her website at www.abcyogaforkids.com.